Concert guitarist and composer Richard Durrant makes a welcome return to Upfront. He will perform solo, instrumental Durrant originals, JS Bach and British Folk from his new double album Stringhenge on a guitar made from a 5,000 year old English Oak tree, his four string Uffington Tenor Guitar and a humble ukulele. Concert guitarist and composer Richard Durrant makes a welcome return to The Cut. He will play Durrant originals, JS Bach and British Folk from his double album Stringhenge with a guitar made from a 5000 year old English oak tree, his four string Uffington, tenor guitar and a humble ukulele. 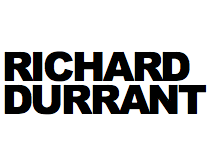 Concert guitarist and composer Richard Durrant performs solo, instrumental Durrant originals, JS Bach and British Folk from his new double album Stringhenge. The show has changed and developed since the beginnings of Stringhenge over a year ago. Interspersed with Richard’s usual wit, expect an evening of exquisite music beautifully played. 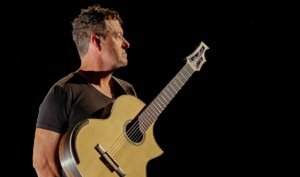 Guitarist and composer Richard Durrant returns to Ropetackle for a concert of solo guitar music. The evening will include a brand new guitar piece, many old favourites and of course, music from his new, critically acclaimed double-album, Stringhenge. Concert guitarist and composer Richard Durrant performs Durrant originals, including the première of a new commission plus JS Bach and British Folk from his new double album Stringhenge on a guitar made from a 5,000 year old English Oak tree, his four string Uffington Tenor Guitar and a humble ukulele. Richard heralds the start of the Christmas season as he returns to Ropetackle with singer Amy Kakoura and master fiddler Nick Pynn to serve a festive feast of tunes from the early music repertoire, British folk, traditional carols and original guitar works. Richard heralds the start of the Christmas season as he returns to Beverley with singer Amy Kakoura and master fiddler Nick Pynn to serve a festive feast of tunes from the early music repertoire, British folk, traditional carols and original guitar works. Richard heralds the start of the Christmas season as he returns to East Chitlington with singer Amy Kakoura and master fiddler Nick Pynn to serve a festive feast of tunes from the early music repertoire, British folk, traditional carols and original guitar works. Richard heralds the start of the Christmas season as he returns to Trinity Theatre with singer Amy Kakoura and master fiddler Nick Pynn to serve a festive feast of tunes from the early music repertoire, British folk, traditional carols and original guitar works. Richard heralds the start of the Christmas season as he returns to All Saints Church with singer Amy Kakoura and master fiddler Nick Pynn to serve a festive feast of tunes from the early music repertoire, British folk, traditional carols and original guitar works. Richard heralds the start of the Christmas season as he returns to Wilmington with singer Amy Kakoura and master fiddler Nick Pynn to serve a festive feast of tunes from the early music repertoire, British folk, traditional carols and original guitar works. A six week introduction to uke playing for complete beginners. The most informative and complete way to start your ukulele adventures. Suitable for teenagers upwards. If your ukulele playing has plateaued, or you’re not sure which direction to take, then this immensely enjoyable and popular musical workout is the perfect solution. 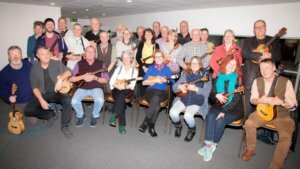 A typical exuberant concert of music played on Guitar and Ukulele with special guests including Richard’s own "Ukulele Circuit Trainers”. 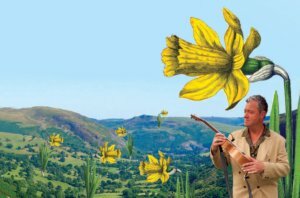 The performance includes the premiere of Richard first Ukulele Quartet “Tan y Bwlch”. Richard Durrant returns to Ropetackle with an unplugged, unamplified recital.